The bees will be in a plastic bee cage. The bees need to be dumped out the end of the cage. This is the last call for package bees. The drop dead date is this Thursday, March 23rd, 12:00 noon. There is going to be some unseasonably cold weather the next few days. It could be a colony killer. It may be a good idea to put a pail of syrup on the hive. If the colony can take it down, the bees will put the syrup around their brood. Having syrup around the brood will make it easy for the bees to survive this cold snap. If bees have to move a frame or two away from the brood to get honey, they may not be able to get enough honey to keep the brood warm and the colony may starve. The feeder will be above the colony and more than likely will not freeze. The heat of the colony should keep it liquid. 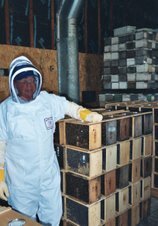 First Class March 26 (1:00-4:00): Introduction to Beekeeping and Bee Hive Box Building. Hands-on: bring hammers, paintbrushes and your creativity. New Start Date: March 26. If you are thinking on planting for a honey crop, consider Sainfoin. This is a legume. It grows well on marginal well drained soil. I do not think it would fare well on clay or wet areas. Planning for planting this should be done now. Locate the seed and figure out how you are going to plant it. Being it is a legume I would think that deer would also like it. Sainfoin may fit well in a deer food plot. It may be better than clover being it is tough and can reseed itself. Here is an article that was in BeeCulture magazine two years ago.